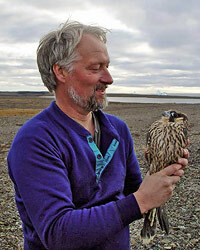 Cal Sandfort has been a falconer for more than 30 years. This interest led him to employment with The Peregrine Fund in 1979. In 1983 he became a raptor propagation biologist and assumed direction for propagation of the anatum Peregrine Falcon and later the Aplomado Falcon, California Condor, and Harpy Eagle at the World Center for Birds of Prey. He obtained a B.Sc. in biology from Boise State University. Cal and his wife Machel and two daughters, Amy and Kristin, live in Boise, Idaho where he continues to learn about birds of prey and their eggs.